Is Gold Forming A Major Bottom? Before diving into Gold’s technicals and recent trading patterns, I’d like to reiterate that I believe Gold is in the process of completing a wide, bear market bottoming process. I’ve mentioned before my belief that Gold double bottomed in December 2014, and it’s critical context to keep in mind as we examine Gold’s current action. When measured against all currencies except the US Dollar, Gold has performed exceptionally well for almost a year. And even against the Dollar – with the backdrop being a parabolic rally in the world’s reserve currency – Gold has performed far better than would have been expected. In Dollar terms, Gold has managed to hold above the bear market low set during the last ICL, and this speaks volumes about Gold’s hidden (and under-appreciated) relative strength. But, just as bull markets can move higher for what seems an eternity, bear markets can meander along a wide bottoming channel for years. As traders, we work hard to determine trends, and can too easily assume that the end of a trend will be quickly followed by a huge move in the other direction. Demanding that a market be in either a bull or a bear market is a fool’s errand, and a market can be range-bound for an extended period and will not necessarily flip between significant uptrends and downtrends. So once Gold shakes off its apathy and begins to break out of its current wide range, there is no guarantee that it will launch into a huge upside move. The evidence that the bear market has ended is very encouraging, but caution is needed when assessing Gold’s upside potential and timing. In terms of Gold’s recent action, I am surprised that we haven’t yet gotten clear resolution to Gold’s Investor Cycle. Normally by day 18, we should know the expected DC Translation and be in a position to project how the IC is likely to unfold. But that’s not where we are with the current DC, which is still too unsettled for clear definition. That said, Friday’s rally provides evidence that Gold may well be in the 1st Daily Cycle of a new IC. The evidence from daily and weekly charts supports the idea that Gold is in a 1st Daily Cycle in a new Investor Cycle. This idea is also supported by COT and Sentiment reports. But for a market that is still technically in a bear market, the evidence of a new IC is inconclusive and premature. We need to remember that Gold is locked in a long term downtrend, with the last DCL occurring on just week 19, a little earlier than would have been expected. The onus is on Gold to prove it’s in a new IC. Absent that, I expect Gold to make one more move lower. If Gold, instead, rallies and can move above the green line on the chart below, we’ll have confirmation of a new Investor Cycle. At that point, the Daily Cycle would be so Right Translated that it could only be a 1st DC. And even under this bullish scenario, Gold could follow the 1st DC top with a deep 68% to 75% retracement into its DCL. Such a deep retracement would shake out many newcomers before Gold would rally in a 2nd Daily Cycle. 4-11 Gold DailyThis week’s Gold COT report is interesting. For the first time in months, speculators have begun covering the large Short positions they amassed with Gold near its ICL. Whenever Gold falls significantly, speculators typically jump on the wagon and help to drive price lower. The below chart shows speculators’ NET position (Long – Short). Each of the troughs correlates extremely well with a Gold’s ICL. During all Cycle bottoms, we see that speculators first begin to reduce their Shorts, meaning they buy to cover their Short positions. During the past 2 weeks, we’ve seen price strength from buying to close Shorts, but not (yet) from new Long positions. This suggests that speculators are about to “throw in the towel” and cover their Short positions en masse, but just haven’t done it yet. I believe the $1,224 area is important here. At that level, I expect that speculators will give up on being Short Gold, and will start covering. Ultimately this will drive Gold’s price up. 4-11 Gold COT SpecI believe that the odds of a new Gold Investor Cycle have moved to the 50% mark. On the weekly chart, it’s a bullish sign that Gold closed above the 10 week moving average. And considering that some technical indicators are turning higher as well, we’re starting to see a pattern that is consistent with the early stages of an Investor Cycle. Typically, a close above the 10wma in an IC that’s this advanced marks a new Investor Cycle. So the bulls are in a position to credibly make the case that Gold has put in a 19 week, double bottom ICL. If that ends up being the case, we could see a substantial rally over the next few months. And if that’s not the case, if the ICL is still ahead, I have a strong belief that downside risk is limited here. Under the bearish scenario, based on the strong performance of the current Daily Cycle, the decline into the ICL should hold above (or only marginally break) the recent $1,136 low. For the past decade, junior mining companies have outperformed senior miners at finding new mineral deposits and generating wealth for investors. These are among some of the findings released in a study conducted by resource company strategist MinEx Consulting, which analyzed the performance of explorers and producers operating in Canada between 1975 and 2014. What the consultancy firm found is that, in the last decade, junior companies were responsible for more than three quarters of all new mineral discoveries and were approximately 30% more effective than senior companies at generating wealth. A good example of such a small-cap miner would be Claude Resources Inc. It is the only producer operating in Saskatchewan, Canada, and managed to turn its operation around fairly quickly after netting a huge loss of $73 million in 2013. The company just reported a profit of $4.6 million in 2014, driven by “record production performance,” according to President and CEO Brian Skanderbeg. For the one-year period, the company is up a phenomenal 216%. Claude has been around for a long time, but its new management understood that it had to change its mining method, which has made a big difference. Junior companies have increasingly played an essential exploratory role in Canada. Nearly 40 years ago, they were responsible for only 5% of all capital spent on exploration; by 2007, that amount had reached more than 6%. Over the past decade, juniors have accounted for 54% of all spending on exploration in Canada. As a result, major producers have steadily lost ground to the smaller players in terms of discovering new mineral deposits. In three of the previous 10 years senior companies failed to make a single new discovery. Not all mineral deposits are created equal. Some might be all a producer needs to be successful, whereas others aren’t even worth the time and capital to develop. A Tier 1 deposit results in a “company making” mine, one that might yield up to 250,000 ounces of gold per year over its lifespan of 20 years or more. Some of these projects can easily be valued at over $1 billion. A Tier 2 deposit is significant but not as profitable as a Tier 1, with a typical valuation of between $200 million and $1 billion. A Tier 3 deposit is considered marginal, valued at anywhere between $0 and $200 million. About 80% of the mining industry’s wealth is generated from Tier 1 and Tier 2 projects. But such discoveries are rarer than Tier 3s. To give you an idea of just how rare they are, consider this: every decade in Canada, the industry discovers on average 40 Tier 3 deposits, seven Tier 2 deposits, and only three Tier 1 deposits. So how do the juniors stack up against the seniors when it comes to finding quality mines? They are running slightly behind. In the past decade, juniors made 7.3 Tier 1 or 2 discoveries in Canada, compared to the seniors’ 8.7. But—and this is a big “but”—they handily beat the seniors when it came to the total number of discoveries. Of all the deposits found, over three quarters were made by junior miners. Juniors spent more than the seniors on exploration during this timeframe ($14.6 billion compared to $12.5 billion), and their discoveries collectively had a much higher valuation ($12.1 billion compared to $7.9 billion). Accordingly, they were roughly 30% more effective than seniors at generating wealth for investors. Gold And Silver Price: Another Quiet Week? In this article, we summarize which events in the week ahead could impact the gold price and silver price. At the bottom of the article we explain that these events are generaly no fundamental drivers, but mostly the result of trading in COMEX futures. The metals are going up and down lately, within a trading range between $1180 and $1230 while silver did not exceed its trading range of $16.00 and $16.50. We expected a quiet week as per our article “Gold And Silver Price: A Quiet Week But Watch Draghi’s Speech” and that is indeed what we got. The week was again characterized by a range bound gold and silver price. For the week commencing April 20th, there are a limited number of economic data of importance to the metals. There is no central bank announcement scheduled, as seen in the table below. Wednesday or Thursday could shake markets with the home sales data in the US, although we do not expect this to be of great impact to the metals. Germany is planning to release its economic sentiment (Tuesday) and business climate index (Friday) but that should not be of any significance to the metals. The most likely scenario is to see a continuation of the consolidation pattern in gold and silver. Note: The primary focus of our website is to report on the different aspects of the gold market: fundamentals, economic and monetary analysis, basic technical analysis. Our view on the real price setting in the gold and silver market differs from the mainstream view. Price changes “happen to coincide” with events, and mainstream media got used to report some sort of relationship between the two. However, we believe that the real price setting is taking place in the COMEX futures market. Market expert Ted Butler does an outstanding job analyzing the weekly evolution in the COMEX market and how it affects price setting. We offer in this article a comprehensive overview of different forecasts and predictions for the price gold in 2015. We hasten to say that our own stance regarding predictions remains unchanged. We have written several times before that “forecasting isn’t about predicting the market; it’s about marketing the prediction” (see The Truth About Gold Price Predictions & Market Forecasts). We also believe there is a “prediction addiction.” That is why we are not taking specific price predictions too serious. We believe, however, there is value in forecasting. A forecast is not about predicting prices but rather describing a future situation, mostly based on ongoing trends. We have selected 6 bullish gold forecasts and predictions for gold in 2015, and 9 neutral to bearish stances towards gold in 2015. 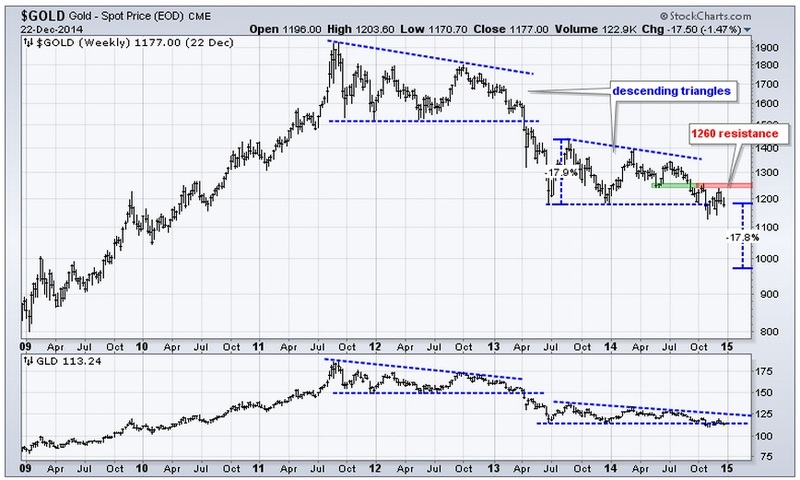 The key theme on the gold price chart are the two trading ranges since gold’s all time highs. One trading range started end of 2011 and lasted till early 2013, the second one is still in play. In technical terms, both trading ranges took the form of a descending triangle. Earlier this year, gold analyst Ronald-Peter Stoeferle released its gold price model for 2015 and beyond. 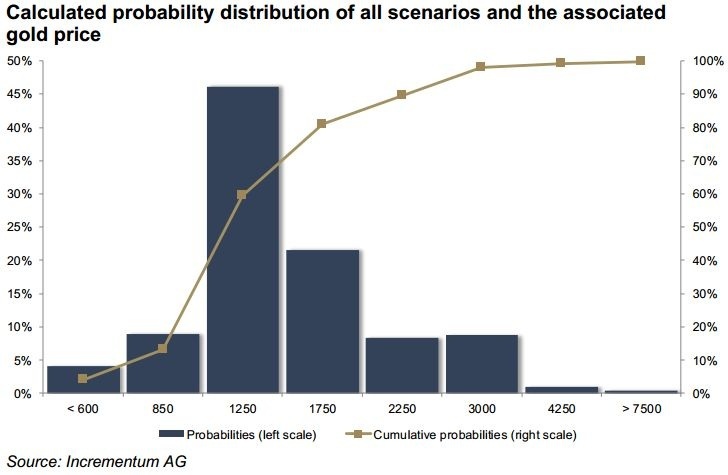 Based on weighted probabilities, his model shows at a long-term expected gold price of USD 1,515 per ounce. Ss the following chart shows, the distribution remains significantly positively skewed. Therefore, should there be a deviation from the currently widely expected path towards stabilization of the central banks’ balance sheet, significant upside potential for the gold price would result. Gero acknowledges that crude oil selling off, and OPEC possibly doing nothing about it, helping crude stay weak, is anti-inflationary—so the people that have been looking for inflation haven’t really found it. But he adds that “now you’re going to see some changes based on all the stimulus in Europe, in China and in Japan. Jeffrey Nichols, Senior Economic Advisor to Rosland Capital, says that 2015 promises to be a good year for gold investors. While the near-term price outlook remains uncertain, I feel fairly confident that gold will be considerably higher at this time next year – and on its way to new historic highs in the years ahead. He sees the following drivers. U.S. economic performance and monetary policy is key – but under almost any economic scenario, he sees gold appreciating. Wall Street’s booming stock and bond markets have been tough competitors to gold but he expects a dose of realism and a substantial correction on Wall Street will reverse the flow of investment and speculative funds away from stocks and bonds back into gold. He also points to the insatiable appetite for gold in China, India, and other East Asian markets. Last but not least, a growing number of central banks will continue buying gold. Marc Faber predicts the gold price might rise to $3,648 by 2018 and the gold price might rise to $7,829 by 2023, driven by money supply and the monetary base. Gold analyst Gary Christenson, author of the book “Gold Value and Gold Prices From 1971 to 2021“, observes that since June of 2013 there has been a modest downward bias in the gold market but that is changing now. 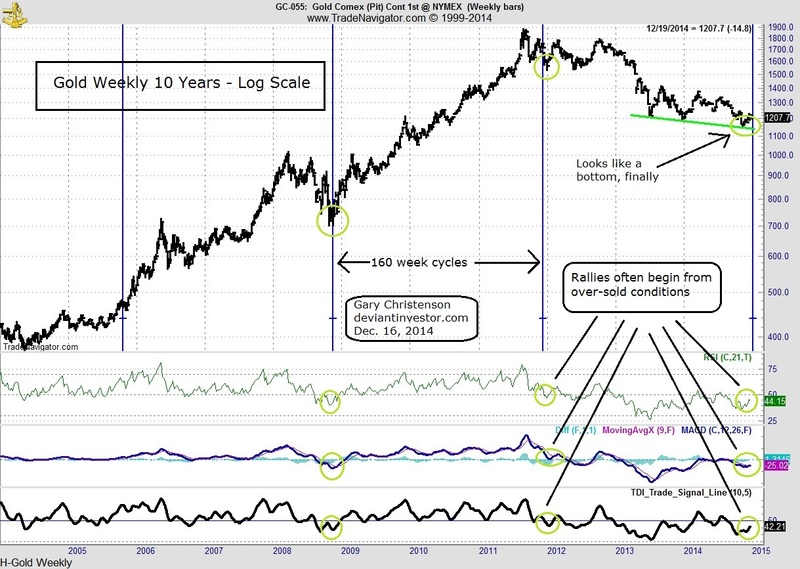 His chart analysis suggests that gold has most likely bottomed and should rally to new highs in 2015 or 2016. Why? Demand from Asia is strong, mining supply is nearly flat, and excess demand has been met by dishoarding and gold “leasing.” China, India and Russia want more gold and some western countries are requesting the return of their gold stored in New York and London. Current financial and geopolitical anxieties will encourage gold price rallies and additional gold repatriation. The weekly chart of gold prices for the past ten years shows important lows in 2005, 2008, 2011, and 2014 – all separated by about 160 weeks. Note the vertical blue lines and the supportive positions of the over-sold technical indicators, the RSI, MACD, and TDI. Christenson says is no guarantee that gold has bottomed and will reach new highs in the next two years, but massive demand, geopolitical anxiety, more war, time cycles, and chart based analysis all suggest that a lasting bottom has been formed and that the probabilities strongly favor continued strength instead of price weakness. BMO Chief Economist Doug Porter warned that interest rates could move higher sooner rather than later in 2015. His 2015 outlook for gold is that it will trade, broadly speaking, where it is today. His assumption for next year is $1,190 per ounce. If the market perceives inflation is becoming a concern, it would be constructive for the gold price. Erica Rannestad, senior analyst, precious metals demand, Thomson Reuters GFMS, agreed that gold prices will likely be lower in the first half of the year because of the Fed’s expected action, which she called “the top driver” for gold-price direction. She said gold prices will likely consolidate in 2015, and lists and a 2015 average price $1,175, with prices trending higher in the second half of the year. Citi Research estimates the average price for gold at $1,220 in 2015. TD Securities lists its average 2015 gold price at $1,225. Natixis forecast gold at $1,140. In an interview with Mineweby, S&P credit analyst Jarrett Bilous said: “We have a relatively stable gold price at $1,200 through 2015-16, and that incorporates our expectation for relatively modest US inflation below 2% through 2016. But we also believe that gold prices will remain particularly susceptible to shifts toward higher US interest rate expectations and a stronger US dollar. We are not forecasting a gold price below $1,200, but there’s certainly the potential that prices could weaken given that, at $1,200 per ounce, the price of gold is close to 50% higher than it was in 2008 when the US started cutting interest rates to support the US financial system. We are expecting at that price, gold will remain highly volatile. It is certainly possible that gold will drop below $1,100. But below that level there’s a lot of capacity in the industry that would not be profitable and would be generating negative free cash flow. So it’s questionable how long certain mines would remain open if prices were to remain consistently below that level”. Almost a century of tradition will disappear from the gold market as technology takes over. Thursday will be the last day that traders at four banks agree by phone twice-daily prices used by miners to central banks to deal and value bullion. Gold will be the last precious metal to drop the London fixings after silver, platinum and palladium made way for electronic auctions last year. More firms able to participate in the benchmark will make the $18 trillion global market more transparent, said ICE Benchmark Administration, which will start running the LBMA Gold Price on Friday. Anyone can follow auctions online, rather than needing a line to a fixing dealer. The first gold fixing took place in 1919. Meetings had been held in a wood-paneled room at Rothschild’s offices in St. Swithin’s Lane until the process was switched to a telephone conference call in 2004. Dealers who met in the room each had small Union Jacks, the U.K. flag, to signal the need to change orders. Those gathering were known to keep yearly price predictions on pieces of paper in an old clock case. The usual offering of coffee and biscuits was bettered by a glass of sherry after fixings on New Year’s Eve, Steve Garwood, a trader at Baird & Co., a precious-metals dealer in London and who first took part in fixings more than three decades ago, said last year. About $18 trillion of gold circulated globally in 2013, according to CPM Group, a New York-based research company. Gold was fixed at $1,149 an ounce on Wednesday morning. Deutsche Bank AG triggered the reforms last year when it withdrew from precious metals benchmarks. That left Societe Generale SA, Bank of Nova Scotia, HSBC Holdings Plc and Barclays Plc to set gold prices. The London Bullion Market Association said last month that Chinese banks are among those in talks to take part in the new method, with a “more diverse pool” of participants. Spokesmen from the LBMA and ICE declined to comment this week on which banks will start setting prices from Friday. The process will still take place at 10:30 a.m. and 3 p.m. London time, with buy and sell orders submitted electronically in rounds until a price is found. Like now, ICE says a chairperson will determine a price for each round and it will then consult on developing an algorithm to do so. Silver, platinum and palladium use algorithms to start auctions, while the London Metal Exchange, which runs the platinum and palladium procedure, also has a committee that can step in if necessary. As tradition cedes to technology, a human aspect will also be lost, said James Moore, who took part in fixings for about five years from 1996. Throughout the 1970s and early 1980s, American investors were gripped by a fear that their national currency would continue to lose purchasing power . There was a complete lack of confidence in the government’s ability to restrict the expansion of the money supply, culminating in panic buying of precious metals in 1979/1980 as investors desperately sought to protect themselves from the effects of inflation. The response of the US Federal Reserve at the time was to put the brakes on money supply growth through the instigation of extremely high interest rates. This policy achieved its purpose and by 1982 the rate of increase in the money supply was trending downwards, interest rates had fallen from their peaks, and the fear of inflation had abated. Investment capital had responded to the changed situation by moving from commodities into financial assets, and the great equities bull market had begun. Below is a chart showing the relationship between the total US money supply (M3), M3 growth rates (shown as annualised monthly figures), and the gold price, from 1972 to present time. It can be seen from this chart that the gold price tracked the increase in money supply from 1972 until 1982, apart from the 1979/1980 spike. Between 1982 and the early 1990s the M3 growth rate trended downwards to a low point of zero in 1992. During this period money flowed into financial assets as confidence was restored in the ability of the Fed to control inflation, whilst the gold price remained relatively stable (apart from the 1985 to 1987 period when the G5 tried to “fix” the US trade deficit by engineering a 40% depreciation in the US dollar, which in turn led to a rising gold price and culminated in the 1987 share market crash as foreign capital panicked out of US assets) . Since 1993, the M3 growth rate has been trending upwards and is currently around 9%. Studies have shown that increasing money supply growth rates lead the commodities markets by 1.5 to 3 years. This means that we should have seen a rising gold price in US dollars by 1995/1996. What we have actually witnessed, however, is a declining gold price. In fact, with money supply now increasing at rates not seen since the early 1980s and the gold price falling almost continuously since February 1996, the chart shows a distinct divergence between the two . This has contributed to the currently popular belief that increasing the quantity of money no longer results in rising prices. As mentioned at the beginning of this article, gold has performed quite well during recent years when measured in terms of almost any currency with the exception of the US dollar. In other words, gold has performed its historical function as a store of value for anyone living outside the US. However, since 1995, the time at which we would have expected to see the increasing supply of US dollars begin to have an impact on the gold price, a massive shift of investment into the US dollar has occurred. The excess dollars which have been created due to expanding US debt levels and trade deficits have been absorbed by foreign investors looking for stability. The seemingly insatiable demand of foreign capital for US dollars has been stimulated even further by the Asian financial crisis. The US is now seen as the only safe place in the world for investment. The demand of foreign capital for US dollars and US debt has allowed US interest rates to remain at relatively low levels, given the money supply growth rate and the strength of the economy, and has supported a speculative boom in the US stock market since 1995. The US stock market is itself supported by debt, and that debt is in turn supported by the value of the stock market. A significant downturn in the stock market would most likely lead to widespread defaults on loans, a financial collapse and a severe recession. This situation will be avoided at all costs by the US political and monetary authorities using the power of the US Federal Reserve to “…discount loans and other assets of banks or other private depository institutions, thereby converting potentially illiquid private assets into riskless claims on the government in the form of deposits at the central bank.” If the Fed must purchase every non-performing loan in the US in order to avoid a serious recession, it will be done. A boom feeds on itself and is always propelled by liquidity. Once a speculative boom has occurred, liquidity must be maintained in order to avoid a bust. Look for continued high levels of US money supply growth. The entire US financial system is based on confidence – the confidence of foreign investors who continue to pour money into US dollar assets, and the confidence of local investors who are betting their life savings on a continued stock market boom. Recent experience in Asia suggests that this extraordinarily high level of confidence in financial assets may be overdone. In the near term, the above-ground stock of gold will most likely continue to be a hindrance to any sustainable rally in the gold price. The supply of gold will probably increase over the coming months as European CBs sell gold in the lead up to selection of the initial EMU participants in May 1998. At the same time, uncertainty regarding EMU and on-going problems in Asia should continue to support the US dollar. Gold has been a poor investment for many years. This is a statement which is almost universally accepted in today’s world, but one which is only partially true. The truth is that gold has been a very poor investment when measured in US dollars, but has generally proven to be a sound investment when measured in terms of almost any other national currency. The Indians and the Chinese, the world’s largest buyers of gold, have seen the value of their gold investments increase by approximately 200% over the last decade. Due to a collapse in their national currencies, South East Asians and Koreans have also seen the value of owning gold. The US dollar reached a cyclical low in April 1995, from which it has risen over 50% against the Yen and 30% against the Deutsche Mark . This means that German and Japanese investors who exchanged their national currency for gold in April 95 would now be showing a profit on their investment, despite a 21% decrease in the US dollar gold price over the same period. What we have witnessed over the past 2.5 years is a massive shift of investment capital into the US dollar from all other currencies, including gold. Investors around the world have placed enormous faith in the US dollar and, therefore, in the US economic, financial and political system which supports the dollar. Gold has been a victim of this flight to the US dollar, although it has fared better than many of the government controlled forms of money. With the US dollar continuing to strengthen as capital flees from EMU-generated uncertainty in Europe and debt-based currency crises throughout Asia, why should anyone invest in gold ? Why not just invest in US dollars and US dollar denominated assets ? In my opinion, there are only two reasons to invest in gold. Many supporters of gold continue to put forward the argument that Central Banks are controlling the gold price. The reason for the popularity of this argument appears to be the misconception that the demand for gold exceeds the supply of gold. After all, if the demand for something does exceed its supply by a substantial amount and for a long time, and the price goes down, then it is logical to assume that there must be dark forces at work to manufacture this unreal situation. The problem is, whenever you start from an incorrect premise and then develop your arguments based on flawless logic, you must necessarily arrive at the wrong conclusion. Perhaps it is hard for goldbugs to accept that gold is a genuinely unpopular investment at the moment when compared to the all-conquering US dollar. However, the fact is that net CB sales of gold over the past few years have been small. Gold loans by CBs have probably had some effect, but the over-riding factor is that private investment demand for gold has reached its lowest point since 1971. Until there is an increase in this demand then the above-ground stock of monetary gold, more than 60% of which is held in private hands, will be an available source of supply. Just as it is wrong to think that the supposed annual deficit in gold supply (the difference between newly mined supply and commercial demand) will lead to a higher gold price, it is equally wrong to think that the above-ground stock held by the CBs is necessarily sufficient to meet demand for many years to come. Trillions of dollars of investment capital is moving around the world each day searching out stability or protection or investment returns. If confidence in financial assets and government controlled currencies was to significantly reduce, then the total gold reserves of all CBs (worth 320 billion dollars at current gold prices) could be absorbed in an instant by private investors. Government controlled currencies are liabilities of the monetary agents and are backed by debt. Their value is hence based on the level of confidence in the financial and political systems and their rates of exchange tend to oscillate daily based on changes in this confidence level. For example, if doubt arises regarding the quality of the debt which provides the asset backing for a currency, then capital will shift from that currency into an alternative investment. Gold, a tangible asset which has been valued as a store of wealth for thousands of years, provides an ideal alternative. Those who are advocating the CB conspiracy theories are failing to appreciate a very important point : The primary reason to own gold as an investment is because it is not controlled by central banks and governments. The second reason to own gold is a corollary of the first. The debt which forms the asset backing of a national currency can be split into two groups – private debt and government debt. The quality of private debt will reduce if the cashflow of the borrowers is insufficient to meet the repayments and /or the value of the underlying security for the loan (real estate, shares, etc) becomes less than the amount of the loan. This is the situation which Japan has faced since 1990 (lending based on collateral rather than cashflow followed by a substantial reduction in asset values has resulted in huge, non-performing private debts). Large scale defaults on private debts will force asset sales, pushing down asset values even further, and stop new investment . Liquidity will thus be removed from the system and interest rates will fall to a point where investment once again becomes feasible. The process is self correcting unless, of course, the government tries to help. “Central banks can issue currency, a non-interest-bearing claim on the government, effectively without limit. They can discount loans and other assets of banks or other private depository institutions, thereby converting potentially illiquid private assets into riskless claims on the government in the form of deposits at the central bank. That all of these claims on government are readily accepted reflects the fact that a government cannot become insolvent with respect to obligations in its own currency. “We have gold because we cannot trust governments.” President Herbert Hoover’s statement in 1933 to Franklin D. Roosevelt foresaw one of the most draconian events in U.S. financial history: the Emergency Banking Act occurred that same year, forcing all Americans to convert their gold coins, bullion and certificates into U.S. dollars. While the Act successfully stopped the outflow of gold during the Great Depression, it did not change the conviction of gold bugs, those who are forever confident in gold’s stability as a source of wealth. Before investing in gold, you must understand its history – a history that, like that of no asset class, has a unique influence on its own demand and supply today. Gold bugs still cling to a past when gold was king. But gold’s past includes also a fall, which must be understood to properly assess its future. In 1797, due to too much credit being created with paper money, the Restriction Bill in England suspended the conversion of notes into gold. Also, constant supply imbalances between gold and silver created tremendous stress to England’s economy. A gold standard was needed to instill the necessary controls on money. In 1968, a gold pool (which dominated gold supply), which included the U.S and a number of European nations stopped selling gold on the London market, allowing the market to freely determine the price of gold. From 1968 to 1971, only central banks could trade with the U.S. at $35/oz. Finally, in 1971, even this bit of gold convertibility died. Gold was free at last. There was no further reason for central banks to hold it. While gold has fascinated humankind for 5,000 years, it hasn’t always been a guarantee of wealth. A true international gold standard existed for less than 50 years (1871 to 1914) – in a time of world peace and prosperity that coincided with a dramatic increase in the supply of gold. But the gold standard was the symptom and not the cause of this peace and prosperity. The events of the Great War changed the political, financial and social fabric of the world – the international gold standard would be no more. While a gold standard continued in a lesser form until 1971, the death of it had started centuries before with the introduction of paper money – a much more flexible instrument for our complex financial world.